The Prince of Peace tells His disciples He did not come to establish peace on the earth. Why? St. Luke tells us about a conversation Jesus had with His disciples that must have surprised them. First, He says, “I have come to set the earth on fire, and how I wish it were already blazing!” This is a remarkable statement. Who says things like this? What did Jesus mean? He is speaking, of course, about the fire of God’s love. He desires to ignite the hearts of all men with it, and He has a plan to make it happen. We can see how eager He is for it to take place. The fire that came down from heaven on the Day of Pentecost, the Holy Spirit, has kindled a blaze that will never be extinguished. God pours His purifying love into us at our baptism, through the work of the Spirit. Divine life now resides in flesh and blood, just as it did in Jesus. All through the centuries since Jesus first uttered these words, the clarifying light of God’s love and Presence have never departed from the earth. Jesus could hardly wait for it to begin. We understand why. Then, Jesus tells His disciples about a baptism He must undergo first. It is not a water baptism, like ours. Rather, it is a baptism—a going down—into suffering and death. The anticipation of this, of course, causes Him “anguish.” We understand why. Finally, Jesus asks a question: “Do you think that I have come to establish peace on the earth?” Well, we’d like to think so, wouldn’t we? Heaven knows we need it. Instead, He tells us He has come to establish “division.” We might ask, “If that is so, why does Jesus so often talk about giving peace to His disciples in the Gospels?” It is true that Jesus came to make peace between God and rebellious humanity. He has reconciled us with God, through His death and Resurrection, healing the estrangement caused by our sin. At long last, we have peace with our Father. In addition, Jesus makes it possible for us to choose to live in peace with others, because the Holy Spirit, that wonderful fire of God, enkindles in our hearts love for others, even our enemies. However, Jesus is speaking here about the division (and lack of peace) the Gospel will cause on the earth. We recall that even before He was born, Jesus was described to His mother as “a sign of contradiction” (see Lk 2:34). She lived to see exactly what that meant. In His public ministry, Jesus aroused opposition so extreme that it eventually turned murderous. The rebellious spirit in fallen mankind is incredibly strong. As followers of Jesus, we introduce the Gospel, with its insistence on our need to repent and believe in Him, right into the bosom of our families. The people who know us best can be offended and angered by this profession of belief. 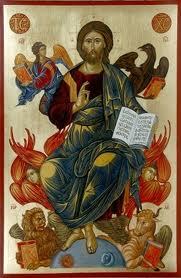 The ties that should be strongest in our lives are threatened by our new allegiance to Christ and the burning desire it brings to see the earth aflame with conversion to Him. What division this can bring among us! Possible response: Lord Jesus, I know the Gospel can give offense. Please help me never to be offensive myself to those who stumble over it. The prophet, Jeremiah, living in the sixth century B.C., had to warn the inhabitants of Jerusalem that because of their prolonged covenant infidelity, God would visit a severe judgment upon them which they must not resist. As we can see, the people didn’t want to hear this from him. They hated him, because they believed he was “not interested in the welfare of our people.” Of course, the exact opposite was true. Jeremiah wanted the people to return to faithfulness to God as their best path to happiness. His critics managed to get approval to do away with him (just as, later, the Jews got Roman approval to do away with Jesus). Eventually, Jeremiah was lifted up out of certain death in the cistern; he prefigured Jesus’ Resurrection from the tomb. In this, we have the Old Testament antecedent to the “division” Jesus warned would come to the earth with the Gospel. The prophets suffered terrible opposition from the people to whom they were sent. When we see how consistently this happened in salvation history before the Incarnation, we shouldn’t be surprised when Jesus warns us that it will continue to happen until He returns. The fact is, the Devil will always be whispering into men’s ears about God: “He is not interested in your welfare.” Like Adam and Eve in the Garden, sometimes, sadly, men will listen to and believe the Enemy of their souls. Possible response: Heavenly Father, give me the courage of Jeremiah to always speak the truth, even when it is maligned as being unloving and uncaring. The epistle encourages us, as we think about the opposition we have perhaps experienced when we have tried to share the Good News with others, to keep “our eyes fixed on Jesus.” He knew the “joy that lay before Him.” Recall how eager He was in our Gospel to set the earth ablaze with the fire of God’s love. This vision gave Him courage to endure the Cross, an opposition much greater than most of us will ever be likely to know. After all, we have not yet “resisted to the point of shedding blood.” This ought to help us “not grow weary and lose heart.” Jesus knows well the anguish that obedience to Him can cause. As the “leader and perfecter of faith,” He doesn’t ask of us what He didn’t do Himself. The fire of God’s love in us will see us through to the end and the joy that lies before us, too. Possible response: Lord Jesus, teach me to endure opposition for the joy that lies ahead, both for me and for those who hear Your Word, even if they seem to utterly reject it.